The Exponent is the student-run newspaper of Baldwin Wallace University, which is intended for the entire college community. The Exponent is funded by the Department of Communication Arts and Sciences as well as advertisements. The Exponent is produced by the student staff on a bi-weekly basis during the academic year. Questions or concerns about the content of articles or other material published herein should be directed to student staff of The Exponent or the faculty advisor. It is the right of The Exponent to print all material deemed newsworthy and gathered in a fair and unconditional manner. No advance copies of stories will be shown, and reporters’ notes are considered confidential. No “off the record” information will be accepted. 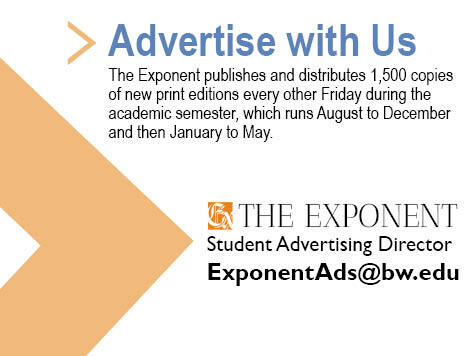 Anyone wishing to advertise in The Exponent should email exponent@bw.edu. Ads must be submitted by the Monday before publication date and not conflict with the university mission. Articles and photographs in The Exponent, letters from readers, columns, cartoons and other elements within these pages do not necessarily reflect the position of Baldwin Wallace University.